Given his extensive writing on the themes of interactive play, rules and spontaneity and their role in the development of children’s thought and language, it is not surprising, in the context of collaborative children’s media production, for references to the work of Lev Vygotsky to emerge (Burn & Durran 2007:13 & Burn 2009:14). Development of a child’s “zone of proximal development” (Vygotsky 1978:90) – the space between independent problem-solving capacity and that achieved with guidance – is a highly relevant theoretical concept in this field. Vygotsky believes that “in play a child always behaves beyond his average age” (1978:102); further, a child’s propensity towards mimicry and roleplay – habits ideally developed from infancy – circumscribe his/her capacity to imagine a different reality. The interstitial spaces made available by these imaginative leaps should be identified and exploited by educators and allowed to flourish, paving the way, according to Vygotsky, for higher conceptual thought and abstraction. Burn and Durran (2007) transpose this theory into the realm of digital video editing. Students borrow ideas and material from available symbolic popular cultural resources and by internalizing, recombining and repurposing audiovisual content they coin the new, brand it as their own and return it to society. The concept of re-presenting sampled audio material has been entirely standard in the realms of professional and amateur popular music mixing for the past few decades, therefore, is it not high digital time to accord similar widespread acceptability in schools to the act of mixing and editing the audiovisual, to Burn & Parker’s “multimodal mixing desk”? (2003b:23) Or might this be regarded by some as the first step on the road to writing’s ruin or the erosion of the film canon? In terms of interrogating the creative process I am interested in exploring intuition and a sense of the present and what the learning outcomes might be if these sensitivities are given the conditions to thrive. Burn & Durran argue that digital production tends to “the expressive needs of the moment” (2007:160) which chimes with Csikszentmihalyi’s research on flow theory. He suggests that “the autotelic experience” of “flow” (1999:824) is a paradoxical mode where one feels firmly in control whilst surrendering to impulse, exploiting a perfectly pitched configuration of skill, challenge and emotional investment. 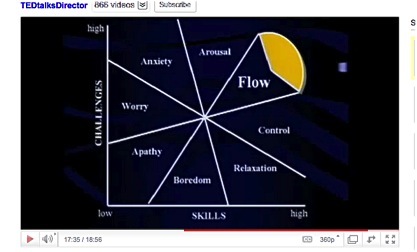 The above chart is taken from a clip of Csikszentmihalyi’s TED talk 2008 where he explores the various emotional stages conducive to the state of flow: a state in which one seems to abandon a conscious state of experiencing reality and enter a new, highly productive and enjoyable realm of focus. The benefits of “intrinsic motivation” have been taken up by Daniel Pink in his book: “The Surprising Truth about what motivates us” (2011) in the context of business productivity. a) reformatting – an aspect of reality is materially reworked. b) adjacency – the juxtaposition of “two unlike domains … the closer they are the more stimulating seems their twined presence” (Sennett, 2008:210). Multiple domains in the case of editing. c) surprise – “you begin dredging up tacit knowledge into consciousness to do the comparing” and experience “wonder” (ibid: 211). Trusting in the feeling of the right editing decision begets confidence and pleasure. Sennett attends to production, context and human emotion in ways that could begin to suggest an alternative paradigm for the analysis of media texts.